The Aesthetic Idealism of Friedrich Schelling gave artworks a role of mental representation of the world. In the present paper, we try to integrate this gnoseological value of Art with the contemporary sociological approach of System Theory. Nowadays, we are witnessing a rapid change in the methods of communication, thanks, first of all, to globalization and digitalization. In spite of this, our thesis is that Art still preserves all its power, both as a communicative instrument and as a hermeneutic tool revealing reality through heuristic paths. Niklas Luhmann says that in a social system characterized by “operative closure” the structure that ensures autopoietic reproduction is represented by communication. In this sense, artworks can be considered as a medium to communicate identity in a self-referential system. In particular, we take in consideration some photographs by the Italian artist Mario Giacomelli (Senigallia, 1925; Senigallia, 2000). As in the myth of Plato’s cave, his photographs are like “shadows” on the wall: the projection, through the artist’s sensitivity, of the socio-cultural identity of peasantry in Italian inland after the Second World War. The aim is to experiment an original reading of these pictures, without referring to the models and knowledge of arts critics. Rather, a conceptual scanning is sorted, to bring out the texture of socio-cultural identity related both to the subjectivity of the artist and the objectivity of his representation. Thus, the product of creativity becomes the link, the “structural coupling”, between the psycho-emotional sphere and other systems: family, economy, religion, etc. And Art becomes necessary to preserve, transmit and reproduce the identity in social systems; both at an ontological and an epistemological level. “Art does not reproduce the visible; rather, it makes visible.” These are the sublime words with which Paul Klee summarizes, we might say, the gnoseologic function of Art. To support this statement, we can start from the Aesthetic Idealism of Friedrich Schelling. According to the German thinker, through philosophical reflection, man has separated rationality from the natural context; with Art, instead, these two spheres are reassembled and objectified in artworks, which represent the meeting point between Reason and Nature. In fact, this philosophic orientation considers an artwork as the combination of an irrational force with the knowledge of the world in which the artist is immersed. The whole philosophical current from Kant to Hegel, which extols dreams, fantasy and imagination, presents the artistic sentiment as a way of leading to the truth. Thus, Idealism gives artworks a role of phenomenological or mental representation of the world. Therefore, we might say that Art is seen as a hermeneutic tool that allows us to come to know the reality through heuristic paths. In the present paper, we try to integrate this conceptual value of artworks with the contemporary sociological approach of System Theory. Niklas Luhmann says that in a social system characterized by “operative closure” the structure that ensures autopoietic reproduction is represented by communication. Nowadays, we are witnessing a rapid change in the methods of communication, thanks, first of all, to globalization and digitalization. In spite of the consequent overturn of the paradigm “medium-form”, our thesis is that Art preserves its whole power, both as a communicative instrument and as an interpretative tool of sociological culture. In order to develop the argumentation, we use the conceptual toolkit provided by System Theory. In fact we assume (using the Luhmann’s terminology) that Art is not a “closed autopoietic system” but a “structural coupling” between functionally differentiated subsystems. Thus, the product of creativity is the link, the “structural coupling”, between the psycho-emotional sphere and other subsystems: family, economy, religion, etc. And artworks are necessary to preserve, transmit and reproduce identity in social systems; both at an ontological and epistemological level. The methodology is the inductive method: we analyze some photographs, depicting a concrete situation, to get to the general principles. In particular, we take in consideration some photographs by the Italian artist Mario Giacomelli (Senigallia, 1925; Senigallia, 2000). The attempt is to experiment an original reading of these artworks, without referring to the models and knowledge of arts critics. Rather, we try a sort of conceptual scanning, to bring out the texture of socio-cultural identity related both to the subjectivity of the artist and the objectivity of the object represented. In summary, through the poetic narrative that develops with the syntax of the artist’s images, we identify the layers of information required to be able to read the social meaning that emerges from the complexity of the inter-systemic territory. 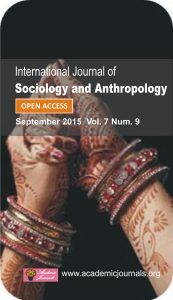 Thus, the paper is an interdisciplinary work, where the ‘”landscape analysis” and the “reading of artworks” are not end in itself, but tools to demonstrate a thesis of Sociology. Such disciplinary “pluralism” enriches the discussion and allows us to identify the mechanisms that make up the connective tissue between the various interacting systems. But overall, interdisciplinary is inherent to a systemic approach, that takes into account the complexity and the dynamic relationships between the various phenomenological aspects. There are two modalities for a thesis’s demonstration. It can be done, quoting Plato, and through the logos (the logical articulation of concepts) that through the mythos (the creative representation). The imaginary is always the mirror of sociological identity in a particular historical context, in a specific place. Let’s take Literature, for example: the routes of the Homeric Odysseus set the boundaries of classic Mediterranean culture, just like the map drawn by the protagonist of Paul Auster’s City of Glass shows the loss of identity in the streets of contemporary New York . 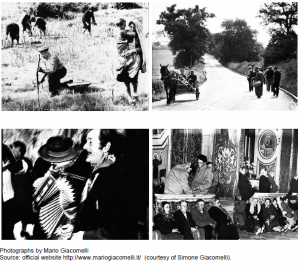 To argue the thesis of the sociological communicative value of art, the paper focuses on the inland of the Marche region in the Fifties and Sixties, and it takes in consideration a special kind of mhytos: the poetry of images. Nowadays what we see is a region stretching from the Apennines to the Adriatic sea, with 6,000 sqkm of hills: a mosaic of fields, woods, farmhouses and hamlets. But the landscape of the inland of the Marche region is constituted also by its festivals and typical dishes, small family farms and up-to-date tractors, religious feasts and folk songs. In other words, it is a distillation of the joint action of man and nature articulated over time. Geography combines with history: from the Picene civilization to the seigniories at war, from the torpor of the Papal State to Italian unification, right up to today’s Europe. But there is more than this to the narrative of the region: the sword of Federico da Montefeltro, Raphael’s paintbrush, Bramante’s pencil, Rossini’s notes, Leopardi’s lines. These different forms of Art express the soul of the area, just like its geology expresses its physical structure. Moreover, every land has its own character. That of the people from the Marche region is described by Guido Piovene as a «skeptical and wise nature, tending to avoid the proximity of all that is great and extraordinary and reduce everything to common-or-garden matter». «Patriarchal rural democracy» is the definition that Piovene uses to describe the traditional society of the Marche region, characterized by an «age-old order», not by «wealth but by decency, based on a few needs, on a natural limitation of consumption: frugality, common sense». The people here have a peevish and kind heart, but above all they are hard workers, passing from the Métayage system of fifty years ago to the small businesses of the present day (one every eight inhabitants), which make not only accordions, paper and tobacco, but also footwear, furniture and boats. The landscape of the Marche region, in fact, takes the form of a journey that, starting from the memories of the past, leads to the present through a series of transformations based on the people’s expectations and on their social and cultural impact. Life in the country was hard in the years after the Second World War. Young women dreamt of moving to town, for its attractions and opportunities, while peasants wished for a steady paycheck at the end of the month. We can cite the historian Sergio Anselmi, who studied the evolution of rural space, reconstructing, in particular, the dynamics of the rural world in the Marche region and highlighting the reasons that, in the Fifties, made many families of the inland decide to establish themselves on the slopes of the hills or migrate towards the towns along the coast. The end of the social and economic system of Métayage and its related housing model based on farm houses caused a rural exodus. However, the traditions and rural culture of the Fifties and Sixties still live in the photographs by Mario Giacomelli, who synthetized and conveyed them with the effectiveness of the emotional strength that only artistic representation can have. Let’s consider the conceptual model developed by Niklas Luhmann, who regarded both literary and figurative expressions – the Art system – as part of an autonomous and functionally differentiated social system (Luhmann et al., 1995). The German sociologist said that ‘Art is a special kind of communication that uses perceptions instead of language, and it operates at the boundary between the social system and consciousness’. In Luhmann’s theory, communication in general is the phenomenological element that makes the existence of a social structure possible through operative closure and autopoiesis, which reproduce a self-referential system in a context of functional differentiation. His hypothesis is that the bridge between these two spheres can be identified in the literary and artistic representations of a landscape made by its inhabitants. If it is true that the environment, both natural and anthropic, is the result of a social, economic and cultural evolution, then the perception of this complex reality by its local artists and writers appears as a heuristic reading path of the territory’s very own identity. The current landscape, where a social stratification adds to its natural one, is the consequence of the work of generations of peasants. Hence, its representation coincides with its poetic description, expressed through the imaginative and emotional power of Art. During a lecture in the town of Ascoli, the painter Tullio Pericoli explained: «You need to contemplate a landscape carefully, take it in and delve into it, with a combination of science and passion, trying to read it like a map or a table in an encyclopedia, looking for its sense and function. But you also need fantasy to imagine, for example, a big bird next to you, ready to carry you on its back and take you on a flight over that landscape, to show it to you with its manoeuvres, sometimes from a distance, others up close, then from up above or down below, giving you the opportunity to see the whole and its innumerable details». 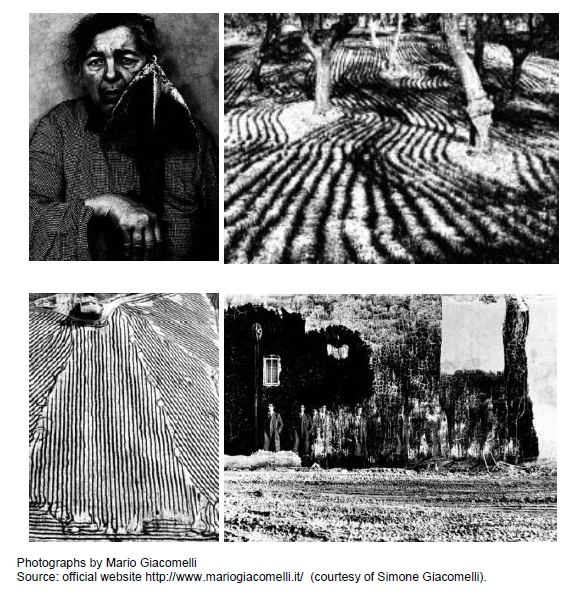 Here is the countryside of the Marche region as it is depicted by Mario Giacomelli. The description of a beautiful, hard and authentic world. The furrows in the ground like wrinkles on a face. The thick skin of the territory with the signs of man and time. The sense of the landscape is revealed in the hermeticism of the essential features outlining its harsh gentleness. The poetics of the place is manifested through the traces left by generations of peasants. In Giacomelli’s black and white photographic compositions, the contrast between light and shade reveals the power of the lines while the images become a text engraved in dark letters on the whiteness of a sheet of paper. The texture of the representation reveals a hidden character, the story of a journey, a voyage of understanding. During this journey space takes form, to recover the dimension of an unusual memory. “It was the landscape that chose me” stated Mario Giacomelli, a photographer that opted for landscapes as his preferential subject, a subject that he loved to the point of taking care of it almost as if it were his own child, going to visit it every day. The artist from Senigallia defined himself as a “realist”, and it could not be otherwise, since his aim was to transfer the whole reality before his eyes into images. His silver bromide prints are an extraordinary representation of the rural landscape of the Marche region and its transformation, as he often immortalized the same views in different moments, even at the distance of years. The result is a gallery of valuable and striking pictures of the Métayage society, in which it is possible to discover the soul of this region, so deeply tied to work and land (Picture 1). Giacomelli captured on film not only images of the landscape, but also impressive scenes dedicated to the work of peasants, like for example the sowing and harvesting of wheat, where physical exertion and celebrations combine. The spheres of the social system recompose in the bare simplicity of the framing: there are backs bent over the land, arms holding children, hands folded in payer and fingers making joyful sounds with the accordion. Economy, family, traditions and religion are the raw material of these snaps, which have an ancient but not elegiac flavor and are of a disarming and honest realism, telling the story of a simple and real world. The gaze, never rhetorical, but intensely poetic, is the reaction to what is seen: the self-observation of the subject and the object mingle. While browsing through Giacomelli’s photographs, we come across a picture of a field with some isolated trees, two of which in the center of the setting, slightly asymmetric. Most of all, we come across dark and sinuous lines on the ground, opening kindly to make room for imposing trunks. The sky is not visible, only the land, with furrows that line and describe it, like undulating pentagrams that extend beyond the framing, suggesting an endless symphony. In ancient times, the practice of plowing a furrow to trace the shape of a village was an act of divination, to be done under favorable auspices. The furrows captured by the artist’s lens, which is almost touching the ground, seem to be the marks of that legacy, archetypes of recurring gestures. Clean lines, which seem engraved firmly but run along a path that gently follows the wavy ground and sort of bows before the centuries-old trees. The father tree. But there is no need to talk about pantheism or religious meanings. Trees provide shade and cool relief in summer, wood and warmth in winter, fruit for the peasants and their animals. Trees and furrows: two presences. Rural culture, which is so strictly intertwined with land, respects them. The magnetic charm of these photographs seems to derive from this combination of strength and gentleness, simplicity and harmony. The furrows dug by man are aligned in parallel with each other like on a written page. The writing of a generation of peasants. Humble people who did not leave individual marks in history, but transmitted their work and their pragmatic intelligence into the natural and anthropic landscape surrounding them. Behind every furrow and every plow there is a man, with his mind, his values and attachments. His physical exertion and his dreams flow inside the furrows, irrigating the land, innervating the trunks of the oak trees, whose roots sink firmly into the earth and branches explode towards a sky that cannot be seen, because the framing cuts out their upward thrust and concentrates there, on the path of the plow, which is repeated always the same and always different, potentially to infinity, for generations. Giacomelli’s sensitive and audacious lens captures those drills and reveals their poetic power: their rhythm and elegance. The field, which is written on like a sheet of paper with light and shade, becomes a page of history, a page of life and passion. The land becomes a face lined with scars and wrinkles, that of its people. Furrows that run far away. Escape routes. Trails to follow on the way back. If we continue to browse through the photo album in our flight high over the area, the lens focuses on a map to be deciphered. Sensory spaces in a two-dimensional drawing, where the geometry of the marks is the warp of a fabric woven by human life. The contrast between the light and dark elements define the structure of the landscape, like an X-ray photograph, and brings out the harsh gentleness inherent in the harmony of the shapes. Looking from a distance, it is possible to see that complex order that would be missed out on from up close. The territory and its shape. The territory and its identity. The territory and its economy. The black and white image synthetizes, as in a last will, the fruitful and constant interaction between the rural society and its territory, the epiphany of an intense action capable of scraping the land surface and modifying its shape. The photograph “Portrait of the artist’s mother” is a black and white half-length portrait built on a marked contrast of light and shade. The old face is lined with wrinkles and partially hidden by the flat blade of a spade held perpendicular to the ground. The woman’s hand, hardened by work, is resting on the haft. The human figure and the tool of her job seem to be competing for the leading role inside the limited space of the photograph. There is no pathetic nostalgia, it is a proud portrait. The woman’s attitude is that of a warrior with her halberd, returning tired from the battlefield. Her face is that of the people born in the countryside of the Marche region at the beginning of the twentieth century, the face of our grandparents. This is the portrait of our land. The chiaroscuro texture tells the hyper-realistic story of a rural world that is not that far back in time. A territory can be effectively told also in this way, through the portrait of a face, one of its countless faces without a name (Picture 2). In the overall approach of a systemic perspective, we affirm that Art is a special means of communication, understood in a constructivist sense. Without illustrating the well-known stages of communicative process, developed by Luhmann, we emphasize that the artworks can play an important role in the communication process, with reference to socio-cultural identity. By an inductive method, we took in consideration some artworks concerning a particular area (the inland of the Marche region in Italy) in a particular period (the years after the Second World War), as an example to draw theoretical conclusions: from a particular empirical reality, to the universal dimension of the communicative function of Art. 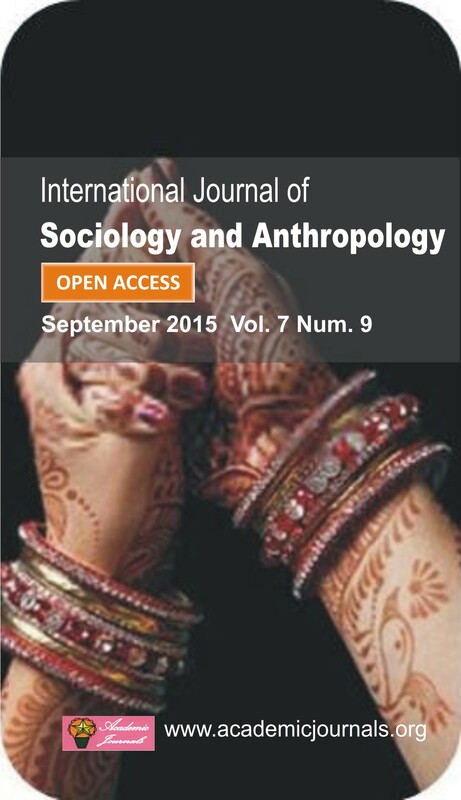 To do this, we integrated the sociological analysis with the poetic-emotional register of the art language. As in the myth of Plato’s cave, Giacomelli’s photographs are like “shadows” on a wall, mental representations of the reality produced by the artist: the projection of the subjective social and cultural identity of peasantry in the Italian inland in the years after the War. In this sense, using Luhmann’s terminology, his black and white prints can be considered, as a medium to communicate identity in an autopietic and self-referential social system. In fact, the landscape represented by Giacomelli is generated by the interaction between different subsystems, and there’s a sort of “structural coupling” that enables this kind of intersystemic communication. It is also possible to give a hermeneutic reading of these artworks, so that they become useful tools for the understanding, on one hand, of the influence of socio-cultural aspects as generative factors of the anthropized environment and, on the other hand, of the perception of rural identity on the psycho-emotional sphere. Giacomelli’s pictures communicate the story of many rural families, their culture and traditions, more effectively than any essay. By looking at these pictures, through the emotional feelings they arouse, we can understand what the life of the people depicted was like: the role played by their job, party, house, family, prayer … Those people integrate with the walls and the land to the point of blurring into them. They draw furrows on the fields that stretch out over the ground like an undulating pentagram. Then they leave, they disappear, and we are told about their absence through the bare shot of empty chairs in a circle (Picture 3). Luhmann N (2000). Art as a social system. California: Stanford University Press. Luhmann N (2001). Sistemi sociali. Fondamenti di una teoria generale. Bologna: Il Mulino. 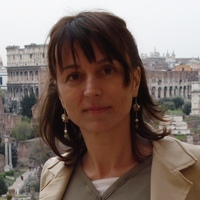 Luhmann N (2012). Teory of society. California: Stanford University Press. This entry was posted in Anthropology. Bookmark the permalink.